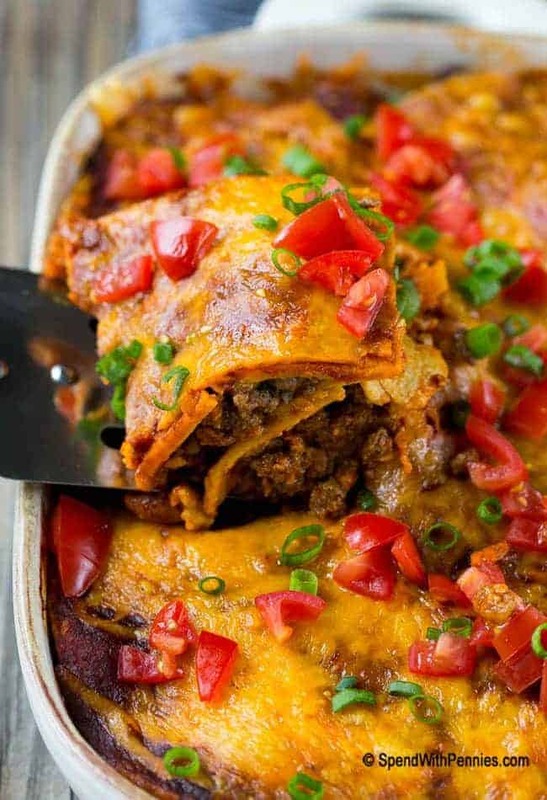 This beef enchilada casserole is layers of ground beef, beans, tortillas and cheese, all smothered in enchilada sauce and baked to perfection. 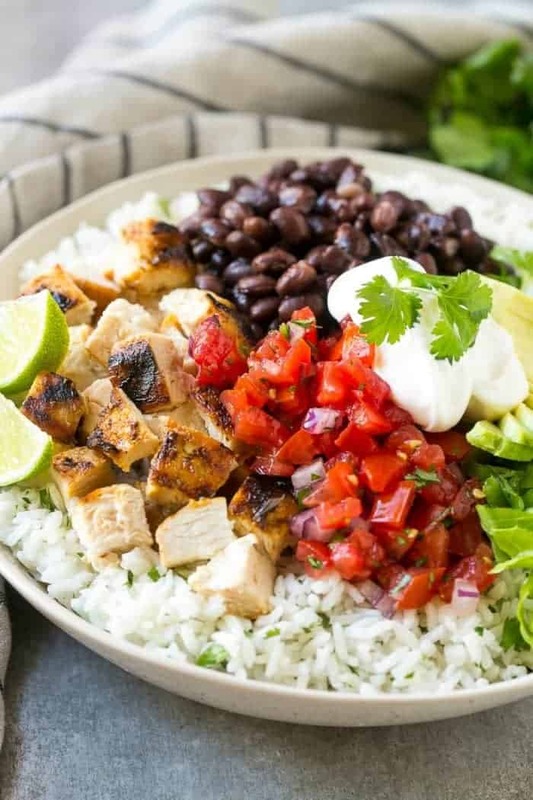 A super easy dinner that’s sure to be a crowd pleaser! 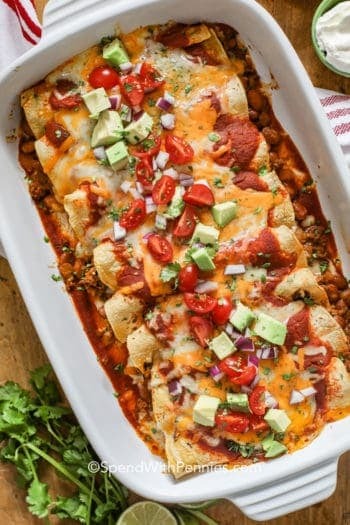 I am a huge fan of enchiladas, who doesn’t love this classic Mexican dish?! 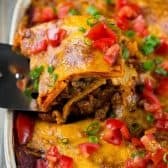 This beef enchilada casserole has all the great flavors of traditional enchiladas but in an easy-to-make casserole form. 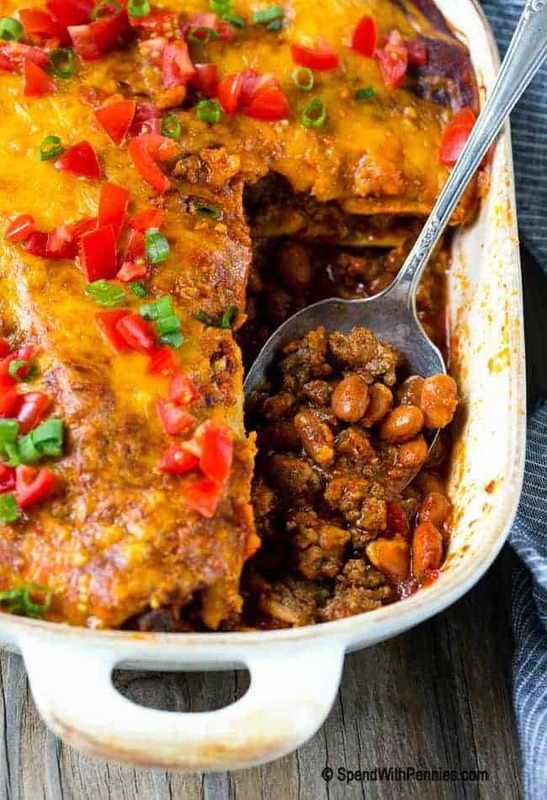 A simple filling of beef and beans is layered with tortillas and cheese in a casserole dish, then baked to melty and cheesy perfection. Add a few toppings and you’ve got a dinner that the whole family will enjoy. The first step in this recipe is the filling. I cook up lean ground beef and season it with taco seasoning, then add a can of beans. My family prefers pinto beans, but you can use black beans if you like. You can also add some veggies during this step, like onions, corn or peppers; there are so many delicious possibilities. I start my casserole off with a layer of enchilada sauce. 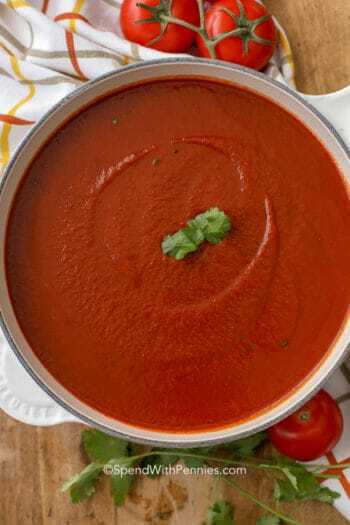 I use a mild red enchilada sauce and pair it with corn tortillas. 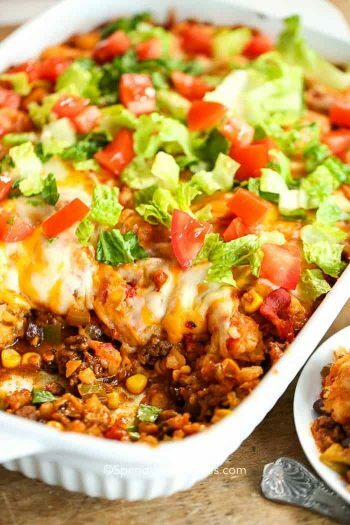 I have made this casserole with both corn and flour tortillas and it’s fabulous either way. If you go with flour tortillas, make sure to buy the smaller soft taco size. 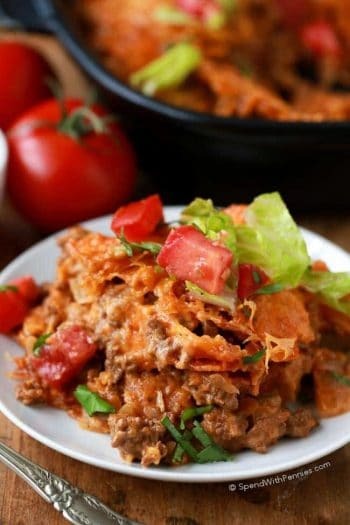 The beef mixture gets layered on top of the tortillas along with a healthy dose of cheddar cheese. 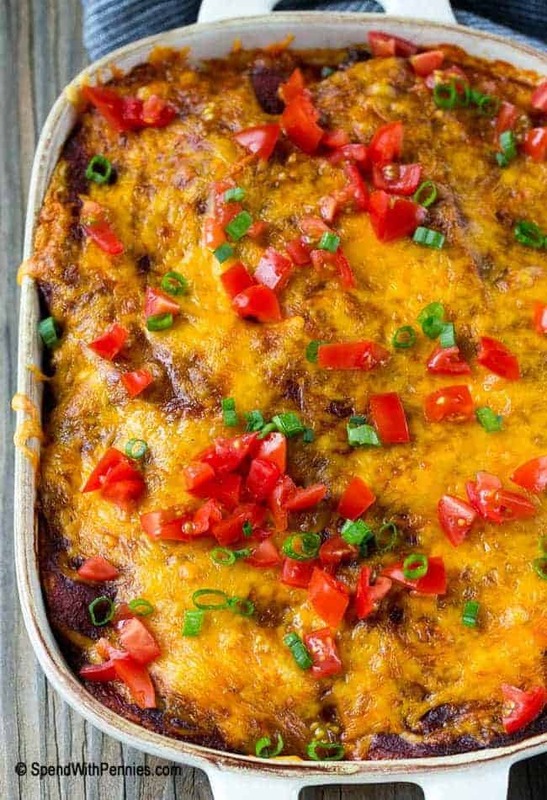 After the layers are piled up high in the dish, the enchilada casserole goes into the oven to bake. 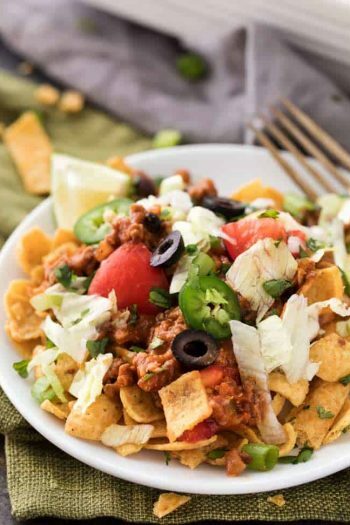 I like to add some toppings after the casserole comes out of the oven; I typically use diced tomatoes and sliced green onions for a fresh flavor. After your casserole has cooled for a bit, slice into squares and enjoy! 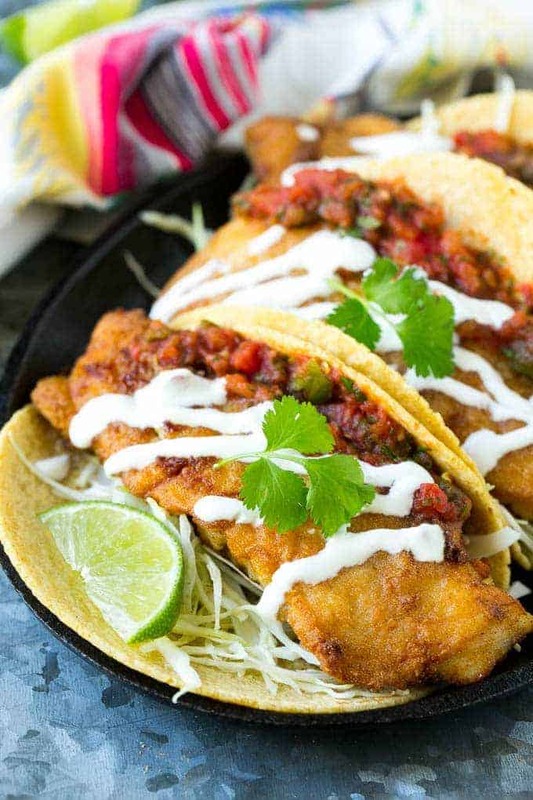 This is a great way to satisfy your cravings for Mexican food without a lot of effort. 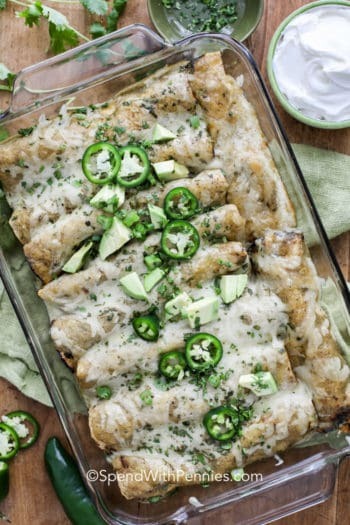 In fact, I prefer this dish to most of the enchiladas that I get at restaurants! Preheat the oven to 350 degrees. Coat a 2 quart baking dish with cooking spray. Heat the oil in a large pan over medium heat. Add the ground beef and cook for 6-8 minutes, breaking up the meat with a spoon. Add the taco seasoning, salt and pepper to taste, and beans; stir to combine. Spread 1/4 cup of the enchilada sauce over the bottom of the baking dish. Layer 1/3 of the tortillas over the sauce. Add 1/2 of the meat mixture, then add 3/4 cup of cheese on top of the meat. Pour 1/2 cup of the enchilada sauce over the cheese. Repeat the process with 1/3 of the tortillas, the rest of the meat mixture, 3/4 cup of cheese and 1/2 cup of sauce. Add the final 1/3 of tortillas on top of the casserole; pour the remaining sauce over the top of the tortillas and sprinkle on the rest of the cheese. Cover the casserole with foil and bake for 30 minutes. Uncover and bake for an additional 5-10 minutes or until cheese is melted and browned. Sprinkle tomatoes and green onions over the top. Let the casserole sit for 5 minutes before cutting. Sara lives in California with her husband and three daughters. She spends a lot of time of time in the kitchen coming up with healthy meals that her whole family will actually eat and enjoy and she involves her girls in the cooking process as much as possible. Between meals she can be found hanging out with family and friends or with a camera in her hand begging her girls to pose for a picture.